Apples and bananas have been fruits that my pregnant belly has been wanting. Over the summer in the earlier part of my pregnancy I wanted berries (specifically blackberries and raspberries). Now that we are easing into fall and berries are no longer local, I have wanted apples. 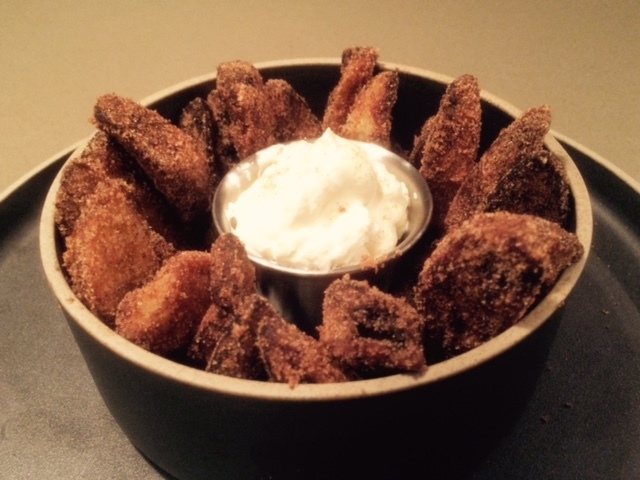 Over the holiday weekend we decided to try this Apple Fries recipe. They were definitely delicious, but in my opinion have two flaws. They take too much time to make than they are worth AND they made the house smell for days. That does not mean it will happen to you, but currently our range does not actually ventilate outside and thus the smell permeated throughout our house. We had to open windows and light candles for a few days to get rid of the apple fry smell. Heat enough oil to cover the bottom of your pan on high heat. Toss apple wedges in cornstarch, coating both sides. Place just enough of the coated apple wedges into the hot oil to make a single layer and fry on each side for 2 to 3 minutes. They should be just golden brown. Repeat with the rest of the apple wedges. Transfer the cooked apples onto a cookie sheet lined with paper towels and drain for a few minutes. Toss in the cinnamon sugar mixture and serve. Whip the heavy cream and vanilla to use as a dip. Yum!